Sometimes life is all about taking chances and calling bluffs and that's exactly what this Riverboat Gamble Costume conveys. 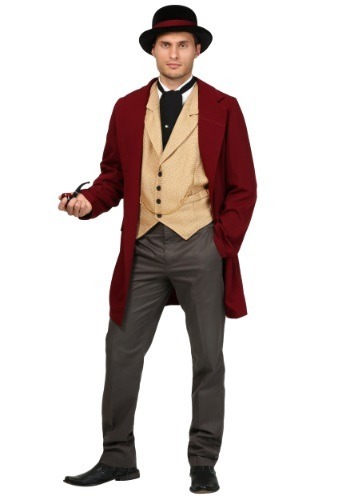 With a vest and jacket that looks like it was taken straight from the Mississippi River in 1890, this costume comes with everything you need to get your life as a card-playing gentleman started. Each piece is made of high quality fabric, so you can rest assured that you'll look smashing while you call Diamond Jack's bluff, or while you flirt with a few of the fine passengers on your latest riverboat casino adventure. This look brings you the real Wild West style that defined the time period, so we have a bit of simple advise when you wear this outfit. Just make sure you pack one of our toy pistol accessories, since you never know when a friendly game of poker can go sideways! Also, gentlemen never cheat (so don't stash a few extra Aces in your sleeve before you sit down at the poker table).